These oversized irons feature a deep cavity with undercut technology, incorporating a thin and tight titanium face set in a cast stainless steel body. XXIO irons deliver great forgiveness, superb distance and ideal trajectory. This state-of-the-art golf club comes fitted with either Srixon's own proprietary graphite shaft or Rifle Steel. These very forgiving irons will enhance the game for golfers of varying skill levels. Lovely irons. I have them in a graphite shaft. Titanium face set in a cast head. Peripheral weighting and no stick on plastic trims. Thin top line with a slight off set. Very workable. They have a beveled sole which does improve the ball striking consistency. Would recommend them for all levels. I changed the grips to a Lamkin and it improved the feel. You will feel the off centre hits but they are quite forgiving. Very expensive new but if you see them on eBay grab them. 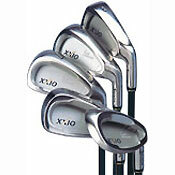 I purchased the Srixon XXIO line of equipment this season, irons and woods. And my golfing has really improved since: I have moved from 24,1 to 12,7 in handicap. I broke 80 for the first time (have played golf for slightly more than one year). And finallly I scored my first eagle as well.